Belarus’ Committee for State Security (KGB) has completed an investigation into criminal charges against Uladzimir Yapryntsaw, deputy director general of Triple Group, and his son Kazbek. “The defendants and their lawyers are studying the case file,” Dzmitry Pabyarzhyn, spokesman for the KGB, told Naviny.by. According to him, Uladzimir and Kazbek Yapryntsaw, who are being held in the KGB detention center in Minsk, face charges of felony fraud under Part Four of the Criminal Code’s Article 209 and, if found guilty as charged, may be sentenced to prison terms ranging from three to 10 years. According to unofficial sources, the arrest of Uladzimir and Kazbek Yapryntsaw stemmed from their large debts and their unsuccessful attempt to pay them off. Kazbek Yapryntsaw promised to supply fuel to a number of foreign companies, but nothing was supplied after the companies paid in advance. Among the cheated buyers was a Ukrainian investment and banking firm called Jaspen Capital Partners Ltd. More than two years ago, the form signed a contract worth more than $1.6 million with Edena Investments for the supply of 2,000 tons of diesel fuel. Kazbek Yapryntsaw was a major shareholder of Edena Investments. Jaspen Capital Partners claims that the deal was guaranteed by Triple Group. The money was transferred to Edena Investments, but the Ukrainian company never received the paid-for fuel. Jaspen Capital Partners sued both Edena Investments and Triple Group. “We took legal action against Edena Investment and against Triple Group, which was the guarantor of the deal,” Peter Spatar, a founder of Jaspen Capital Partners, told Naviny.by. In an attempt to pay off the debts, which amounted to several dozen million dollars, Kazbek Yapryntsaw initially tried to make money on forex trading but failed and asked his father for help. Uladzimir Yapryntsaw turned to his old friends for help, including to Mikhail Mamiashvili, president of the Wrestling Federation of Russia. The renowned retired wrestler agreed to lend a large amount of money to Uladzimir Yapryntsaw against the security of his stake in Triple Group. When Uladzimir Yapryntsaw was arrested by the KGB in August, Mamiashvili became a co-owner of Triple Group. “Roughly speaking, this is how things happened,” Mamiashvuili told Naviny by, refusing to give any details. According to the Belarusian Ministry of Justice, on August 19, 2015, Mamiashvili was entered in the list of shareholders of Triple Ltd and the name of Uladzimir Yapryntsaw was struck off the list. This happened after Yapryntsaw had been arrested. While speaking to reporters on March 15, KGB chief Valery Vakulchyk said that it was Yury Chyzh, the main owner of the Triple conglomerate, who reported illegal activities by Uladzimir Yapryntsaw, his longtime business partner. A probe was launched at the request of Chyzh and his two Russian business partners, said General Vakulchyk. 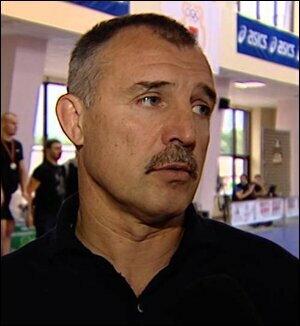 At the time of his arrest, the 54-year-old Uladzimir Yapryntsaw chaired the Belarusian Sambo Federation and the Belarusian Judo Federation. The probe into Yapryntsaw’s alleged offenses reportedly led to criminal proceedings against Chyzh himself, who wasarrested on March 11, along with several executives of Triple Group. Chyzh and the executives have been charged with felony tax evasion, an offense penalized under Part Two of the Criminal Code’s Article 243, and are being held in the KGB detention center as well. Triple, which was founded in 1992 as a limited liability company dealing in the wholesale of industrial and food products, has since grown into a conglomerate that runs construction, building materials, non-alcoholic beverage, retail chain customs services, restaurant and other businesses. Chyzh was often described as the wealthiest businessman in Belarus.